But, not yet for the Susans! The Susans are still going strong. The wet summer and cooler temperatures during July have kept them perky and thriving. Rudbeckia hirta is a plant that can tolerate dry conditions, but they do much better in a moist, well draining soil....The nemesis of plants here at Clay and Limestone! I've written about that here. They still look early summer fresh...We've had a good summer. ...Maybe I ought to take a page from Frances' plant propagation program for specific traits and save the seeds of the doubles. 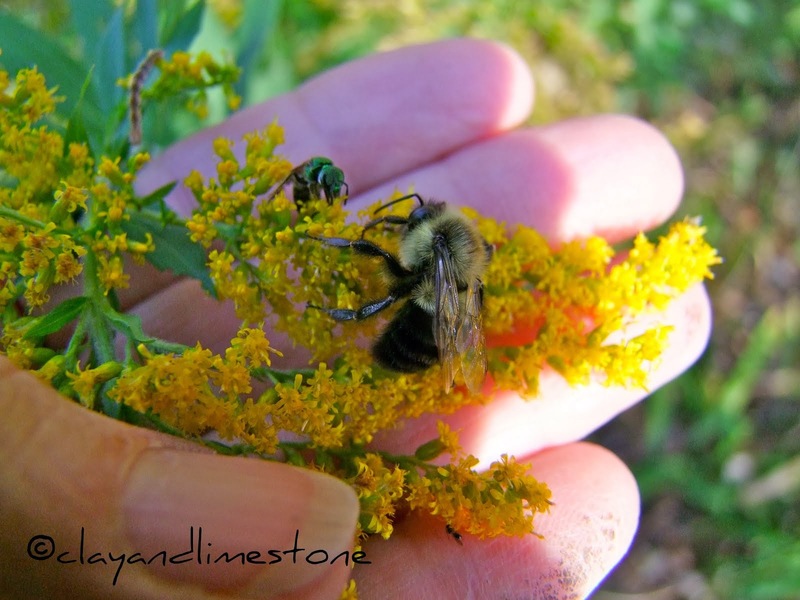 She's written a great post on her gravel grown plants~~go here for the story. The doubles are kind of cute....Although, it's probably an odd virus and not some genetic sport! 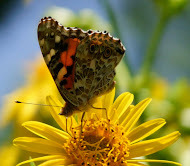 You might not see many butterflies on the Susans. That's a duskywing (?) in the above photo. The Silvery Checkerspot and the ever present skippers are the most frequent visitors. Bees do stop by occasionally. Then they quickly brown. The petals dry up and the seeds ripen. In the past, I've deadhead them to encourage more flower growth. I've not had outstanding luck with that and now just let them go to seed....for more plants and for bird food. They aren't the preferred food of Goldfinches, but, they will eat the seeds once the coneflower heads are empty! The Susans are getting thinned this year! I do adore the mass planting. But, it's time to thin or they will over run the salvia, liatris, coneflower, baptisia, rosemary, sedges, sedums, coreopsis, stokesia, grasses, veronicastrum, monarda, zinnias and other plants that are actually growing in the Sunny Susans bed! If you live nearby I will gladly share them with you. Let me know if you want seeds! Believe me, there are plenty to go around! They ought to be a hardy genetic stock! I hope these last days of summer are filled with golden flowers and plenty of time in the garden. Yes, I have some of those golden Susans here. Our asters aren't blooming just yet. It won't be long. I think I need to give my rudbeckia fulgida the boot and plant rudbeckia hirta. From the look of your gorgeous displays, may I assume that the deer and rabbits leave them alone? PS Hope your tendonitis heals quickly. I know the "feeling" from years on computers and Blackberry thumb typing! Cameron, Yes...not a bunny or deer ventures into the Susans...and we have them both in the neighborhood. Do you want seeds of the R hirta? They look great as they are but you don't want them to take over your other plants. You should save the seed and bring it to the fall plant swap. They'll trade seeds and all kinds of stuff. Gail! All those Susans are so beautiful! I particularly LOVE your first photo. Wow...a sea of gold. It couldn't be any prettier. They are stunning displays of color and texture, I love what you are doing. Hi Gail, I love them as much as you do. I have a new one this year but it's an annual. Rudbeckia triloba, new to me and I already love it. Not as carefree as goldstrum (had to stake it) but love the bloom. I love all your beautiful Susans, Gail do you know the botanical name? Great photos especially the first one, kind of wild and crazy...I like that. I never tire of yellow and golds. Though it is funny that inside my house most of it is in shades of greens and blues and only one room in yellow-that will change soon. I just realized that. Nevermind, I'm digressing. Gotta get busy so I can some see those Susans in person! They are glorious! Odd, the difference a wet summer makes. Last year in August, I had great wads of Susans at the south end of the long rock bed. This August, there are NO Susans -- they left in early July. There are masses of reseeded Melampodium happily providing a different yellow this year, huge things. Gail, your susans are beautiful! It looks like a field of gold in front of your house! !I'll love golden yellow. Rudbeckia hirta is so on my list!! Gail your bed of Susans is magnificent. I can't get over how beautiful it is. I love your garden ornament too. What a pretty bunch of Susan's and very helpful information on growing them, too! Gail, I love the masses of Susans. What a joy it must be to see them swaying in the breeze. But I know what you mean about thinning them out. I am going to have to do that with the coneflowers. They are overtaking the 2 beds I have them in. It breaks the heart, but must be done. :) I did transplant some seedlings earlier this summer to other beds to spread them around a little. How are you doing? You haven't said anything about your hand in a while. Hope you are doing better. There's lots to do this fall. Gail, are you interested in mailing some seeds to Illinois? I'll send you some Canadian columbine seeds in return! Hi Beckie, I am so glad you like the Susans...need seed? It is hard to edit, but so necessary once in a while...it's like that in and out of the garden. I cleaned out a closet today...what a mess;) My thumb is better~~ I did have a steroid injection that helped, but, too much of any repetitive action seems to annoy the joint! So I try not to type too much...sigh! Hi Gail, I almost asked you if you thought Susans were beautiful! ha! But they are. I shared a whole huge vase of them with friends today. What a joy. Is your last photo a variety of Painted Daisy? Oh, they're beautiful, Gail. Like a sunny prairie under your trees! Some sprakling yellows there Gail! Quite a mass effect. The last pic reminds me of the aster I showed, and also your question – the 'Monch' was in one garden, and the orange in another – but they would have looked quite stunning together! You've got that massed planting for effect thing down. It looks lovely. I still haven't figured how I could work that shade of yellow into my garden during the summer. It works better with the shades of autumn here. So your yellows are taking over. Funny, I was just noticing that my front yard is too lavender right now and needs more pink or peach or something - maybe some coneflowers or dahlias mixed in next year? My walker's low catmint is STILL going strong - hasn't been without blooms since May - and the Salvia farinacea and lavender verbena are blooming. May Night salvia and campanula are blooming in the west bed, but the daylilies are mostly done. It will be fun to plot all winter for more late-summer color next year. What a beautiful planting of black-eyed susans! They have always been one of my favorites and you have most certainly done them justice. Thanks to these gorgeous photos I just might have to plant some more this fall! They're gorgeous Gail, and it will be fun to see how the bed looks after you've edited. I'm glad your thumbs are feeling better. Hope they continue to recover. In the meantime thank goodness for cortisone. Hope you have a wonderful weekend! They look so beautiful in such numbers - a real eyeful. I need to expand my one or two plants. what an inspiration! Thanks for the information on the Susans and butterflies. I think that is a duskywing. I saw some last year, but haven't this year. I saw a number of checkerspots last year, too, but don't remember if I have seen any this year. Yellow can be seen from far away and I do love the big impression yellow groupings make, and Susans excel at that!